A keynote presentation by Rahul Asthana, regional marketing director at Kimberly-Clark in Singapore, triggered a follow-up discussion that basically confirms two things; first that marketing technology is no longer an option but a top priority in MNC’s and secondly that organisational or structural changes are needed to address the complexity of the new marketing age. Let me explain. Rahul stated in his keynote that at some point in time he realized a change was needed. There was clearly a need for a hybrid individual i.e. a marketing technologist that works in partnership. To address this, Rahul decided to hire a person for his team that has this hybrid profile. He was looking for someone who has deep knowledge and understanding of marketing technology but who has also a marketing background and the customer. That sounds easy but it still took him 6 months to work with HR on creating the right job profile and then finding the right candidates. In the end, the role of this person is defined as a marketing technology expert and in the team structure this person works with the marketing directors and IT. On the one hand they work with IT to source the right solutions and platforms. On the other hand they work with marketing to ensure that the solutions are used to improve the relationship with the customer while it also increases the brand equity. So a marketing technology expert is not an IT-person but also not a marketer. He or she is the bridge between IT, marketing and the customer. Adding this person to the team, he told me, has improved the use of marketing technology at Kimberly-Clark. In the follow up discussion, Rahul started sharing e-commerce data from within APAC with me. He mentioned a number of interesting points, which provide enough for a separate post about e-commerce and its importance for FMCG brands. One impressive thing he mentioned was that in Korea, 85% of diapers as a cate gory are sold via e-commerce channels and not via brick-and-mortar retail. This underscores the opportunities, specifically in certain product categories, for further growth in other APAC countries for e-commerce as a channel. It also shows how disruptive e-commerce potentially can be for retail in the near future. But that Rahul uses a lot of data in his discussion is not a coincidence. It proves that data at Kimberly-Clark, is an integral part of marketing. He explained how this led to the identification of the need for a 4th person in the team. And you’ve guessed it; a marketing data analyst with customer facing experience. 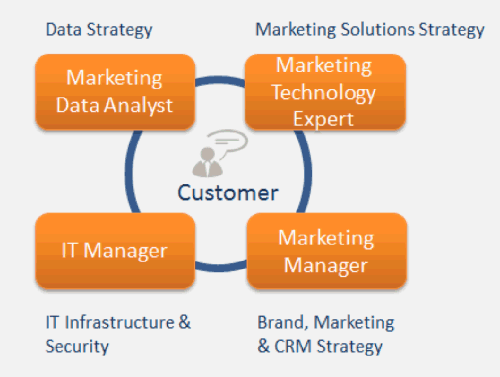 Adding the marketing data analyst leads to a team of four people that manage, plan and drive a number of things between them. In an ideal world it is the voice of the customer that leads them. The analyst will be the one who should be connected to the customer via data. He should be able to monitor changes and identify opportunities. This means that data should be presented to the marketing manager in a digestible way. The analyst should also be aware of the brand and marketing strategy so that his reports can support in the actual execution and measurements. The marketing technology expert should be able to identify the right solutions and report formats that the analyst works with. IT is the partner that ensures safe storage of data, with sufficient capacity and accessibility. The expert should be able to recommend and source the best solutions and platforms. On the one hand this should include what is needed today but ideally these solutions are sufficiently flexible to cater for future changes. The marketing landscape, specifically in digital, is changing faster than ever before. Programmatic advertising e.g. was not even a topic 3 years ago. Today it is disrupting business models of both the publishers and the media agencies. Many companies were caught with their pants down by Google’s search algorithm change and learned the hard way, that since that day they need a mobile compatible, fast loading website. The expert should really balance his role between his 3 peers as they are equally important in identifying and sourcing the right solutions. His biggest challenges are probably the privacy and security discussions with IT. Also, due to the rapid changes in the digital marketing landscape, the expert will often face challenges when it comes to replacing or upgrading solutions that are redundant or obsolete. Traditionally he or she has been the person that had to combine the role of the expert, the analyst and marketing itself. In the new set up the manager will have to delegate a number of tasks and responsibilities to his peers. He will be dependent on sourcing the right solutions to achieve his marketing KPIs. At the same time he needs the reports to communicate internally how marketing is delivering as well as to understand what needs to be changed. The relationship with IT will probably be loose. The analyst and the expert have a far greater role to play in working with IT and ensuring that customer-facing solutions are customer friendly and deliver on the KPIs. You might think that the role of IT is diminishing in this set up. In my opinion IT’s role is in this set up actually better defined. IT can truly focus on infrastructure and security. Specifically the latter is more important and complex these days than ever before. The role of IT in general as an enabler and facilitator is growing by the day. Topics like BOYD and cloud-solutions increase the use of digital technologies in a company and in the relationship with the customer. So IT will certainly have nothing to fear when it becomes to their relevance and importance. The situation at Kimberly-Clark is certainly not unique. But up till now I haven’t heard very often that marketing complexity and the need for data are addressed this through the addition of a marketing data analyst and a marketing technology expert. Or when I heard about it, it is usually accompanied by remarks that hint towards failure more than success. The learning at Kimberly-Clark is that hiring the marketing technology expert is a win-win solution for the company. The expert identifies the right technology tools, works with marketing on how it fits with the brand programs and with IT business partners that own the architecture and construction. This partnership turns out to work well for them. Setting up a marketing team like this, or at least the strategic core of it, is an acknowledgment of the growing complexity of marketing. A glance at any marketing automation lumascape will be enough to understand why you need someone who is at home in this complex landscape of solution providers, technologies and upcoming trends. Gone are the days that a marketing manager could run campaigns from start to end within one team of marketers. There is simply not enough time in a day to keep up. If your company and marketing teams are not going in this direction yet, then it is time to jump into action mode. Rahul needed 6 months to find the right profile. 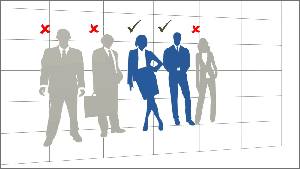 Your competitors are probably going that way and a look at most job sites, shows that companies are looking for them. Need help? Do not hesitate to connect with me. Thanks for reading and Rahul, thanks for the inspiring me to write this article and providing me with some great insights from within Kimberly-Clark.